At Speedcar UK and Ireland, besides offering the best of new machinery, we can provide a number of preowned solutions for those on a tighter budget or who may prefer to find their feet in buggy racing before committing to a brand new Speedcar. We accept trade-ins from customers upgrading to one of our brand new buggy's and we may also buy and sell any used machines that we feel are still competitive therefore offering a range of options in order to satisfy the needs of each and every one of our customers. 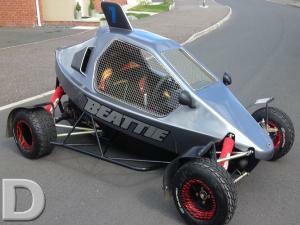 Speedcar Xtrem, 600cc Suzuki engine, 6 speed sequential gearbox, Brembo disks and calipers and Ollé ³ way adjustable shocks. Also fitted with some optional extras such as a handbrake and upgraded Yoshimura Exhaust system. The bodywork and chassis have been recently re-sprayed. This buggy has been well maintained and is a great option for anyone looking to start competing in this category but will also be a suitable choice for a front runner as the previous owner achieved consistent podium finishes and was always fit to compete in this package.